One of the nice things about reading e-books on a Kindle is that a great many books are available either for free or for a very low price because they are older books whose authors are long dead and the copyrights have expired. These low-priced or free books are some of the greatest classics of literature and naturally I have been interested in reading them, particularly the classical Greek and Roman mythological epic such as Homer’s Iliad and Odyssey and Virgil’s Aeneid. Now I have recently come across a pair of news stories that suggest that the backgrounds of these epic poems may not have come entirely from the minds of the writers, that there may be a kernel of fact behind the fiction. First, there is this interesting article from the Guardian on some recent research about the mysterious Etruscans who lived and ruled in Italy before the rise of Rome. The Romans themselves were not Etruscans but the Etruscans heavily influenced Roman culture. Unfortunately, the written language of the Etruscans remains undeciphered, so little is known of them, except what the Greeks and Romans have written about them. The latest findings confirm what was said about the matter almost 2,500 years ago, by the Greek historian Herodotus. The first traces of Etruscan civilisation in Italy date from about 1200 BC. About seven and a half centuries later, Herodotus wrote that after the Lydians had undergone a period of severe deprivation in western Anatolia, “their king divided the people into two groups, and made them draw lots, so that the one group should remain and the other leave the country; he himself was to be the head of those who drew the lot to remain there, and his son, whose name was Tyrrhenus, of those who departed”. But the latest conclusions may add weight to a rival, apparently more fanciful, theory that links their name to Troy, the “city of towers” and a part of the Lydian empire. The most likely date for the fall of Troy, as described by Homer, is between 1250 and 1200 BC. Virgil’s Aeneid tells the story of a Trojan prince named Aeneas who fled with his family when the Greeks destroyed Troy. Aeneas led his followers around the Mediterranean until they settled at last in Italy where after many adventures he established a kingdom. His descendants were Romulus and Remus, the legendary founders of Rome. Virgil wrote the Aeneid in the hope of creating a national epic for the Romans in the same way that Homer’s Iliad and Odyssey were for the Greeks, and he consciously inserted what might be considered political propaganda justifying the leadership of Rome over the known world, and also the role of his patron Augustus Caesar as the first Emperor of the Roman Empire. This does not mean that Virgil simply invented the plot of the Aeneid. Instead, it seems that he made use of Roman legends concerning the Trojan origins of the Roman people that had been told for generations by combining them into a more unified and coherent story. The Romans were not themselves Etruscans. They were clearly natives of Italy, closely related in language and culture to many other people living in south and central Italy. The Etruscans clearly influenced the development of Roman culture and it is likely that they brought the alphabet to Italy, as well as many other elements of civilization. If the recent findings about the origins of the Etruscans from Lydia in Asia Minor, the actual location of Troy, then it is possible that the legends that Virgil drew upon to create the Aeneid are a distant memory of a real migration from Asia Minor to Italy, perhaps by refugees fleeing war and the destruction of their homeland. But what about Homer? Unlike Virgil who lived at around the time of Christ and so is well known to history, Homer lived at a time when Greece was emerging from a dark age. Not much is known about Homer, even whether a poet by that name ever really existed. Homer’s Iliad tells the story of an dispute between Achilles and the other leaders of the Greeks during the Trojan War and of Achilles’s personal feud with the Trojan prince Hector. The Odyssey tells the story of the Greek Odysseus’s trials as he sails home after the war. It wouldn’t seem likely that these fanciful tales are based on real, historical persons, yet, there really was a Troy, or at any rate a city at the legendary location of Troy. This city was burned down several times and rebuilt, but it is not clear whether the Greek stories of the Trojan War are a memory of an actual siege of the city. Still, there is this story I read in the Independent. The Odyssey is one of the great works of ancient Western literature, written eight centuries before the birth of Christ and four centuries after the fall of Troy. Generations of classicists have pored over the many lines of Homer’s epic description of the long journey taken by the hero Odysseus to his home island of Ithaca. Now two scholars have found evidence to support the idea that one line, in the poem’s 20th book, refers to a total solar eclipse that occurred on 16 April 1178 BC – the day when Odysseus returned home to kill his wife’s suitors. If true, this would date the fall of Troy itself to precisely 1188 BC. The idea that The Odyssey refers to a total solar eclipse, when the Moon blocks out the Sun completely, is not new. It was first suggested by ancient scholars, but it was only in the 1920s that astronomers were able to calculate that such an eclipse over Greece around that time could only have taken place on 16 April 1178 BC. Instead of looking at when a solar eclipse occurred in history, as other astronomers had done, they investigated the timing of a new moon, the simultaneous appearance of two stellar constellations in the evening sky, and appearances of the planets Mercury and Venus. All four phenomena are mentioned in The Odyssey which gave Constantino Baikouzis of the Observatorio Astronomico de La Plata in Argentina, and Professor Marcelo Magnasco, of the Rockefeller University in New York, another way of checking the date when Odysseus is supposed to have returned to his home on Ithaca to kill his wife’s suitors. They calculated the pattern in which these four events occurred, from the references mentioned in The Odyssey, and compared them against patterns gleaned from 135 years of astronomical data – nearly 5,000 days. The result was they found just one date that could have been the fateful day. It was the same 16 April 1178BC that was known to have been a total solar eclipse. “What are the chances of having two different ways of dating the text and both agreeing on the same date? We calculated the chances of these two dates agreeing by chance alone is something like one in 50,000,” Professor Magnasco said. Obviously the more fantastic elements of Homer’s tales such the cyclops or the miraculous involvement of the gods, but it is altogether possible that the legends of the Trojan War are derived from a real war and the Iliad from an actual incident in that war. The Odyssey may be a dim memory of actual troubles faced by men returning from this war to find matters at home not as they might wish. Who can tell? OK, this part was probably made up. The Birth of Classical Europe, by Simon Price and Peter Thronemann is the first book in a series, The Penguin History of Europe. This first book covers the beginnings of Western Civilization from the Trojan War to the time of Augustine of Hippo. That is a lot of ground to cover in only four hundred pages, and The Birth of Classical Europe barely skims the centuries of history. Still, these are appropriate endpoints. 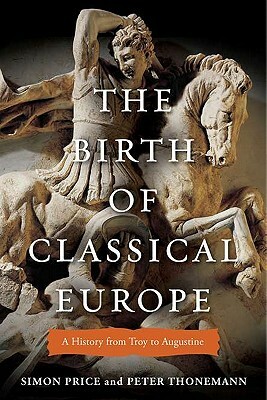 The Birth of Classical Europe is really not so much a narrative history as a study on how history was used by the Greeks, Romans, and others to establish their place in the world. For the people of classical Europe, the Trojan War was, in many respects the beginning of history, as the first event of consequence that they could date and had any information about. The fact that their information was filtered through the legends memorialized in Homer’s Iliad and Odyssey, and that they did not, in fact, have any real knowledge of the events centuries before their time was irrelevant. Greek cities and families traced their origins to heroes and events in Homer and other myths and any new custom or institution was invariably held to have had its actual origins in the legendary past. Thus, Athenian democracy, which was only fully established in the fifth century, was believed to have been started by Theseus. The Persian invasion was another chapter in the long struggle between East and West. The Romans got into the act too. They believed themselves to be descended from the Trojan prince Aeneas and placed themselves firmly in the mythological history of the Greeks. Even unrelated peoples such as the Gauls and inhabitants of Asia came to view themselves in this context. If the Trojan War is a good point to begin this survey, than Augustine is the natural endpoint. For by Augustine’s time the rising faith of Christianity had begun to create a new historical context for the people of the West. While the Romans hardly abandoned their classical heritage, they did begin to draw more on the history in the Bible to understand their place in the history and the world. This tendency perhaps reached its climax with Augustine’s greatest work, The City of God, and it may well be said that after him we find the habits of thought we associate with the medieval period. The Birth of Classical Europe is worth reading in order to get a good bird’s eye view of the formation of our civilization and if it has a fault, it is simply that there is not enough space in the book to give every cultural and historical development its full attention.